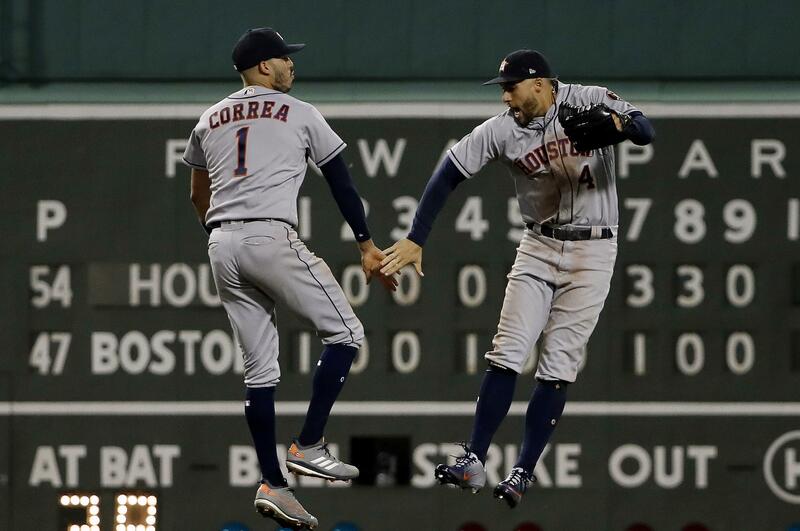 Carlos Correa hit a tiebreaking sacrifice fly in the eighth inning and the Houston Astros won their sixth straight game, beating the Boston Red Sox 6-3 on Friday night in Boston in a matchup of A.L. division leaders. Boston starter David Price had allowed just one hit and retired 14 in a row when he went into the seventh with a 2-0 lead. He left after Alex Bregman’s double and a walk and, after Ryan Brasier took over, the Astros scored three times. Boston’s J.D. Martinez tied it in the bottom of the inning, a single giving him his second RBI of the game. Houston scored three more in the eighth. Correa put the A.L. Central leaders ahead, a wild pitch by Joe Kelly (4-2) scored another run and Tyler White added an RBI single. Dodgers 4, Rockies 2: Clayton Kershaw threw six strong innings and Kenta Maeda finished the ninth in place of All-Star closer Kenley Jansen as visiting Los Angeles moved within a half-game of N.L. West-leading Colorado. Yankees 4, Mariners 0: Masahiro Tanaka struck out 10 in eight innings, and Gleyber Torres and Andrew McCutchen each hit a two-run homer as New York handed Seattle its fifth shutout of the season. Athletics 8 Rangers 4: Athletics rookie Ramon Laureano hit two home runs, Marcus Semien also went deep and Oakland beat Texas in Oakland, California. Oakland got its fourth win in five games overall and seventh in eight against Texas. The A’s are 30-15 since the All-Star break. The A’s remain 3 1/2 games behind first-place Houston in the A.L. West and 3 1/2 back of the New York Yankees for the top A.L. wild card. They moved 6 1/2 games ahead of Seattle for the second wild card. Diamondbacks 5, Braves 3: Paul Goldschmidt hit his 33rd home run and Arizona took an early lead then held off Atlanta in a matchup of slumping playoff contenders in Phoenix. The N.L. East-leading Braves lost for the fourth time in five games and had their edge over Philadelphia cut to 2 1/2 games. The Diamondbacks, who had lost five of six, moved within 1 1/2 games of Colorado atop the N.L. West. Angels 5, White Sox 2: Two-way star Shohei Ohtani homered for the third straight game after learning he will probably need Tommy John surgery, launching a three-run shot to cap Los Angeles’ four-run third inning against the White Sox in Chicago. Phillies 4, Mets 3: Rhys Hoskins hit a tiebreaking homer in the eighth inning to make a winner of Aaron Nola, and Philadelphia beat the Mets in New York. Carlos Santana lined an early two-run shot for the Phillies, who began the day trailing Atlanta by 3 1/2 games in the N.L. East. The first-place Braves played later at Arizona. Nola (16-4) struck out eight over seven innings to match Washington ace Max Scherzer for the National League lead in wins. Those two are in a tight race with Mets star Jacob deGrom for the N.L. Cy Young Award, and Nola helped his cause with deGrom sitting in the opposite dugout. Rays 14, Orioles 2: Blake Snell tied the major league victory lead with his 18th, Nick Ciuffo and Kevin Kiermaier hit three-run homers and Tampa Bay beat Baltimore in St. Petersburg, Florida. Blue Jays 3, Indians 2 (11): Kevin Pillar hit a solo homer in the bottom of the 11th after A.L. MVP contender Jose Ramirez grounded out with the bases loaded in the top of the inning, allowing the Blue Jays to beat Cleveland in Toronto. Pillar’s second career walkoff home run came off right-hander Adam Cimber. It was Pillar’s 12th homer of the season. Pillar had reached third base with two outs in the ninth, but Neil Ramirez sent the game to extra innings by getting Richard Urena to fly out. Yan Gomes hit a solo home run for the Indians, who entered with a magic number of seven to clinch their third straight A.L. Central title. Cleveland loaded the bases with two outs in the 11th, but Danny Barnes relieved Jake Petricka and got Ramirez to ground out to second base. Brewers 4, Giants 2: Jesus Aguilar hit a two-run double in the seventh inning to lead the Brewers past San Francisco in Milwaukee. Aguilar sent a low, 0-1 pitch from Tony Watson into the gap in right-center field to score Curtis Granderson and Eric Thames. Hunter Strickland started the seventh and walked the pinch-hitters. Watson took over one out later. Tigers 5, Cardinals 3: Jeimer Candelario hit a two-run homer with one out in the ninth inning, lifting the Tigers over St. Louis in Detroit. The Tigers won their third in a row. Marcell Ozuna homered twice for St. Louis, which has lost four of six. The Cardinals hold a slim lead for the second N.L. wild-card spot. Pirates 5, Marlins 3: Jordan Luplow hit a tiebreaking two-run homer in the seventh inning, Josh Bell also had a two-run shot and the Pirates rallied past Miami in Pittsburgh. Twins 10, Royals 6: Eddie Rosario homered, Ehire Adrianza had three hits and three RBIs and Minnesota beat Kansas City in Minneapolis to snap a five-game skid. Reds 12, Padres 6: Scott Schebler’s grand slam set a Reds season record, and Phillip Ervin homered twice as Cincinnati pulled away to a rain-delayed victory over visiting San Diego. Schebler’s home run was the Reds’ 10th grand slam this season. Cubs at Nationals, ppd. : The game between the Chicago Cubs and Washington Nationals in Washington was postponed after two rain delays totaling more than four hours. The game was scoreless in the top of the second inning when it was called. The teams will play a doubleheader Saturday starting at 3:05 p.m. Published: Sept. 7, 2018, 9:24 p.m. Updated: Sept. 7, 2018, 10:59 p.m.